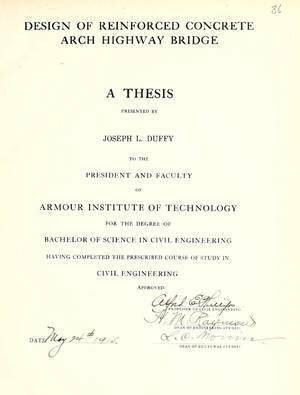 The item Design of Reinforced Concrete Arch Highway Bridge : A Thesis, Joseph L. Duffy, (electronic resource) represents a specific, individual, material embodiment of a distinct intellectual or artistic creation found in East Baton Rouge Parish Library. Thesis (B.S.) --Armour Institute of Technology, 1915.